*1 cup dry makes 3 cups cooked. In a large pot, heat oil over high heat. Add bell peppers, onions and garlic; sauté for 5 minutes, stirring frequently. Add chili powder, cumin and cayenne; cook for 1 minute, stirring constantly. Add tomatoes, breaking them up with a spoon, and broth; bring to a boil. Reduce heat to medium-low; simmer for 15 minutes to reduce liquid slightly. Stir in chicken, cooked kidney beans, salsa and corn. Bring to a boil. Cover, reduce heat and simmer for 5 minutes, or until chicken is cooked through. Stir in black pepper and salt. 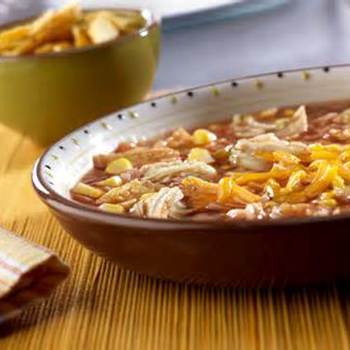 Serve with a topping of shredded cheese, sour cream and chopped green onion.